Cocobella Cultured Coconut Cider is a sparkling beverage combining the goodness of coconut water, fermented apple cider vinegar and real fruit. It contains no added sugar and prebiotics which work to maintain a healthy digestive system. Perfect for when you need a refreshing hit or enjoy it with your meals too! 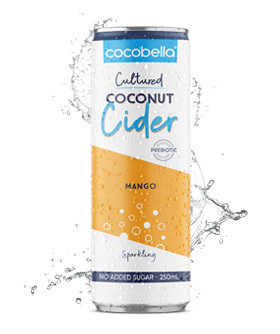 Cocobella Cultured Coconut Cider is alcohol and caffeine free and contains no stevia or sugar alcohols.